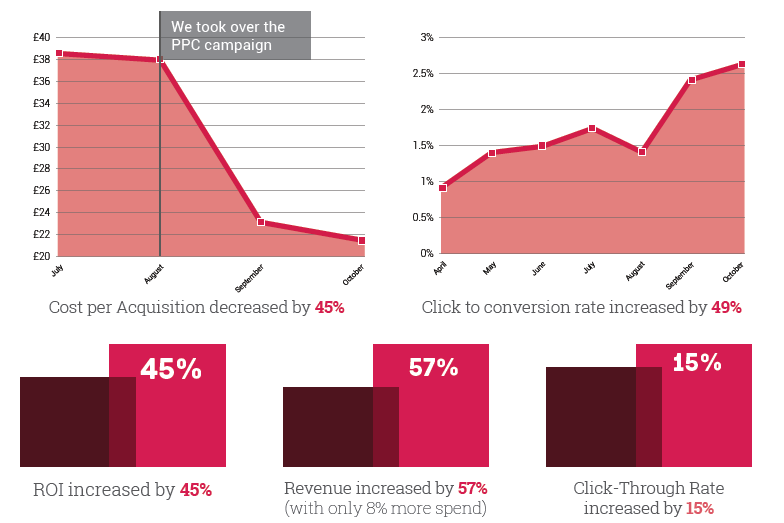 These days there are a number of bells and whistles attached to PPC campaigns. And while these shiny new features can often provide the icing on the cake, it’s important that we don’t forget about the old stalwarts of paid search and online marketing. What got us here in the first place was not mobile ad extensions, callouts, remarketing lists or Kim Kardashian’s backside. Nope, it was good old fashioned keyword research. Recently, here at Strategy Digital, we took over the management of a company who design and sell reproduction furniture. The account presented us with a problem. Although their shopping campaigns were returning decent numbers, the search campaigns were about as busy and important as Deputy Prime Minister, Nick Clegg. Remember him, the man lurking behind David Cameron, struggling to make a difference? So what did we do? We started with PPC keyword research, that’s what. The previous search campaigns were full of tumbleweed ad groups. And by that, I mean ad groups that had 0 impressions and 0 clicks over the course of six months. There is really no point creating ad groups that get no traction. As paid search marketers, it is important that we create ad groups from the perspective of the shopper and not the other way round. 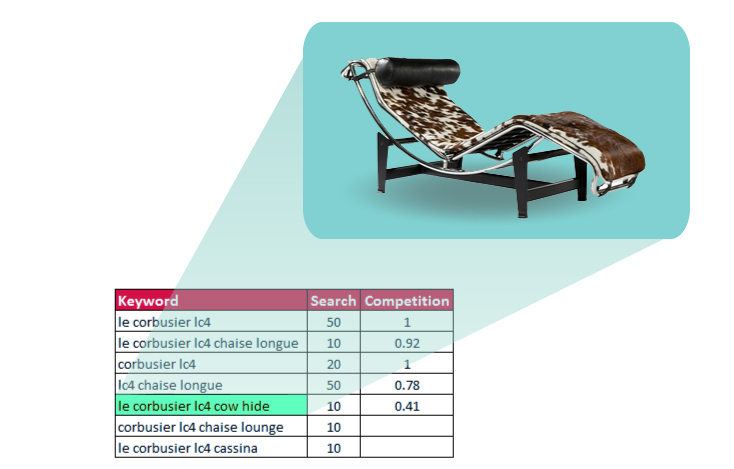 Just because Jim from the warehouse calls the ‘Le Corbusier LC2 Comfort Sofa’ the ‘big fat comfy one’ does not mean we should start targeting ‘big fat’ keywords. We need to think about how people looking for products perform their searches. And how do we do that? Yup, you guessed it – keyword research. 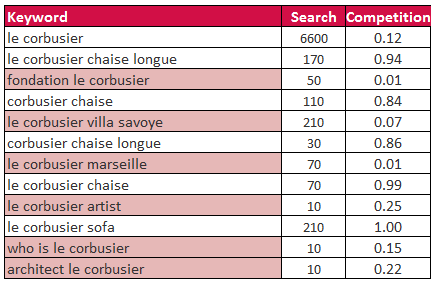 Suddenly, three quick searches have given us a coherent structure for targeting Le Corbusier’s LC4 Chaise Longue and, what’s more, we are going to fill these ad groups with real search terms from the perspective of the consumer. Keyword research can help us become knowledgeable about the subject we are marketing, and that’s important. 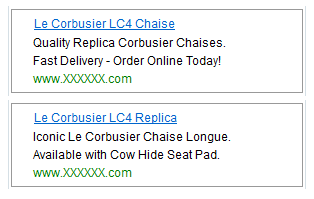 It is crucial that I, for instance, know the difference between an LC4 Corbusier and an LC2 (one’s a chaise longue and the other is part of three-piece suite) and why the LC4 Chaise Longue sometimes references ‘Cassina’ (the company that Le Corbusier designed for). It’s simple. If I don’t understand what I’m marketing, I’m going to struggle to market it effectively. Not sure? Test, Test, Test! Sometimes keyword research can throw up some grey areas and broader targeting can be favourable. 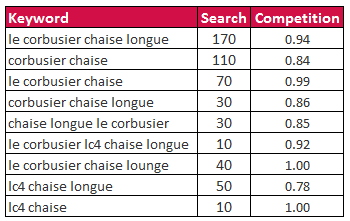 For instance, if Le Corbusier produced the ‘LC2 Grande Chair’ and the ‘LC2 Comfort Sofa,’ what should we do with [Le Corbusier LC2] search traffic? Previously, our client avoided it and focused on very specific search terms. However, these very specific search terms had no search value. 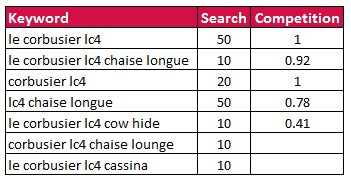 Conceivably, the person looking for either the sofa or the chair in this instance is still going to search [Le Corbusier LC2] and by not targeting this, you are excluding yourself from both markets. Now here is another scenario: what if the company didn’t stock the chair but just the sofa? 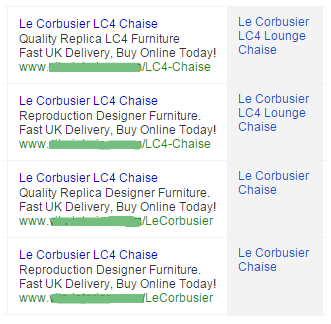 Here you should still be targeting ‘Le Corbusier LC2,’ but you need to make sure that the fact that this ad leads to the LC 2 Grande Armchair takes pride of place in your ad copy. At this point, I should say pay attention to results. Only by testing whether an ad group works can you find out which terms drive awareness and which drive sales. But, really, keyword research should play just as vital a role in identifying important negative themes as it does in looking at themes to target. There is a common misconception amongst paid search marketers that you can negative-out keywords with the traffic coming in. However, this retroactive approach will waste client’s money, when there really is no need. Of course we all know the odd keyword will sneak through the cracks and hence the importance of search query reports in weeding these out. But even the most basic keyword research should have negatives jumping out at you. Let’s take Le Corbusier again. Already we’ve got ‘Fondation,’ ‘Villa Savoye,’ ‘Marseille’ and ‘Who is’ as keywords we either need to make negative immediately or do some further research around. La Villa Savoye, for instance, is modernist villa designed by Le Corbusier and, once upon a time, the Nazis took over the house and used it for storage. (Ad) Copy What You See! The importance of creating granular ad groups with the help of thorough keyword research is so that we can tailor our ad copy to the inbound search query. The old ad copy, pictured above, is lazily produced for a number of reasons. There is very little thought about the keywords that may have brought the user to the ad, the two ads are very similar and, what’s more, the ad isn’t telling us anything extra. There is no real hook that will make this ad stand out against the others. The focus has, again, not been the consumer. Really, we should use keyword research to instruct how we go about creating our ad copy. Let’s take Le Co…. (You get the point). And all thanks to sticking to the most fundamental element of paid search campaign: effective keyword research! To talk to us about how we can take your PPC to the next level, visit our PPC service page, or call Mark Poppleton on 0117 971 2499 or get in touch via our contact form.